What makes the Emotional Beginning Program work? Research models developed by Liz Bates, T. Berry Brazelton, Robert Emde, Stanley Greenspan, Louis Sanders, Allan Sroufe, Edward Troinic and Lev Veygotskey serve as the theoretical frame work for the Emotional Beginnings Program . 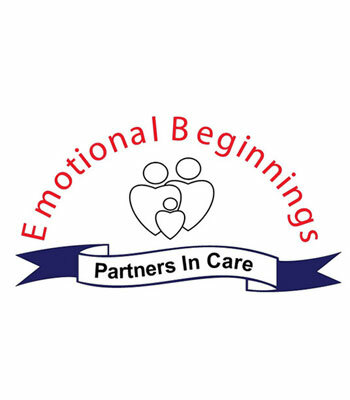 Emotional Beginnings (EB) is designed to involve the child as the teacher by focusing the childcare provider on the child’s needs and emotional communication. EB’s use of the “Caring Connection Plan” allows the children to teach, which validates and empowers the provider. According to research, supervised practice and coaching are critical to the effective integration of new skills into a person’s behavioral repertoire. Setting up an opportunity for the childcare provider and child to interact with one another and offering technical support is an integral part of the EB Staff Development Model. Development of a monthly “Caring Connection Plan” by each caregiver helps caregivers to increase emotional availability skills and build a positive relationship with each child. Emotional availability is being able to read, listen and respond appropriately to others’ emotional signals. Children who have emotionally available caregivers learn more and are more psychologically stable, they show more resiliency and ability to be independent and problem solve. Sharing positive experiences makes learning fun for childcare providers and children. Emotional Beginnings starts with a basic understanding of the emotional needs and development of infants and toddlers and how caregivers can make more positive connections with the children. By respecting each baby’s biorhythms, that include a predictable pattern of eating, sleeping, and states of awareness, caregivers can build a trusting relationship with each individual child. Understanding a child’s ability to communicate through emotional signals is not always easy. The emotionally available caregiver is able to match cues to a child’s feelings and needs and responds appropriately. Learning about differences in temperament and the general development of each child is a critical component in being able to provide every child quality care. The day-to-day care of children is filled with joy and difficulties. Anger, teasing, shaming, fear, distrust etc. are roadblocks to learning. Negative emotions used sparingly can caution, teach and show respect. Emotional energy is something caregivers use all the time. Caregivers need to find ways to replenish this energy and take care of their own needs. Caregivers who take care of their needs are better able to meet the emotional needs of children. Sharing fun and positive emotions are essential to relationship building and leads to feelings of closeness, confidence, trust and acceptance. Based on a process developed by Dr. Stanley Greenspan, caregivers learn the importance of providing individual playtime with each child and how scaffolding can extend and expand play. Infants and toddlers want desperately to belong and to please, and they are learning the rules to fit in socially. Music, rhythm, rhyme and fun are powerful tools for helping young children learn the Do’s. Understanding and respecting a child’s need for both dependence and autonomy is critical in an emotionally responsive relationship. Developing feelings of interdependence with colleagues can enhance a caregiver’s commitment to professionalism. The sessions will begin at 8:30 a.m. each day and end by 5 p.m. Please note that lunch is on your own and no evening activities are planned. You will need to bring your PIPE Curriculum with you to this training. If you have purchased curriculum it will be waiting for you at the training. You will receive a Certificate of Completion for the 16 hours of contact time at the close of the training. Training locations will be included in participant’s letter for additional sites. at Grant Drive turn south, (left) Immaculate Heart of Mary is located on the right. Enter through the church’s main entrance. When you reach the top of the stairs go down the corridor on the left and follow the signs will direct you to the training room in the Parish Center. Hotels near the training location. Super Shuttle is available to get from the airport to the hotels and to the training site. This entry was posted on June 13, 2013 by designvv.